C and G Auctions have an estate auction tomorrow. They are good auctions, and you can make some real finds here for very low prices. Check the pictures and list of things for sale at the auction from here. Remember - you have a chance to see what is available for sale from 9.00 on the day, you must register first in order to bid, and there is an 11% premium placed on everything you buy. 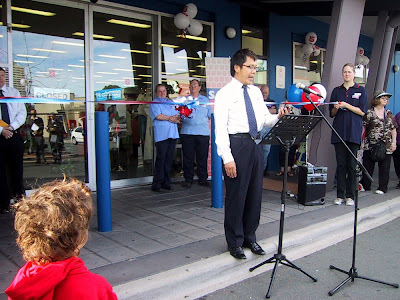 Went out and enjoyed garage saling this morning - nearly called in to see you TSS... but realised we were out of room. Queanbeyan Uniting Church has a jumble sale on - at the back of the church - and for wool lovers - they have a bit of a range there for cheap cheap prices. I got 4 full balls (50g) of knitting cotton for $1. 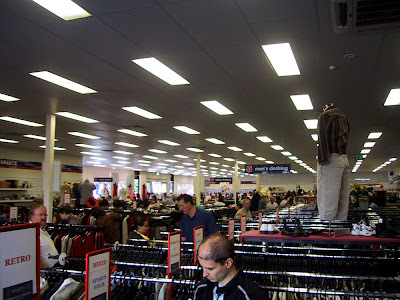 Another good source for the occasional bargain is one of the many Embassies that are located in Canberra. 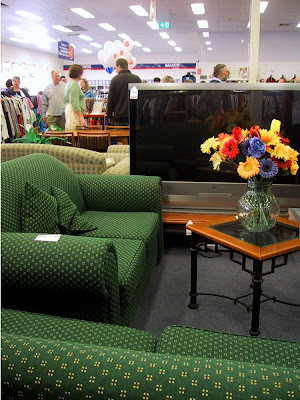 Every so often they will have tender sales or Auctions of their unwanted furniture and/or office equipment. 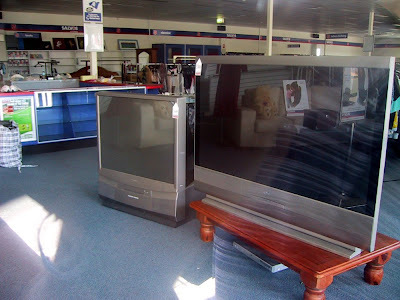 On Wednesday 4 March 2009, the US embassy is having a Tender Sale of unwanted furniture and equipment. Inspection and bidding is from 11am to 2pm and the sale location is. Remember, it is a Tender sale rather than an Auction or Garage sale. In a Tender sale you wander around, inspect the items and place a Tender bid on them. At the end of the Tendering period, the bids are collated and the person who bid the highest for each item gets that item. The results are posted outside the embassy, and on the web. You then have to pay and collect your items in the period set a set time / date. 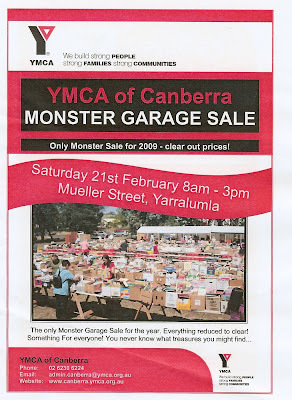 On Saturday Taph and I went to the YMCA garage sale, because it is fun, to go, to the YMCA garage sale (Sorry, but as I write this, that song is still going through my head). We got there after 12, and in doing so were able to pick up a couple of bargains. 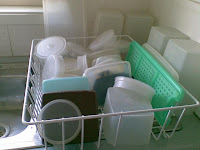 Taph managed to pick up all this Tupperware for a couple of dollars. Y's Buys has everything half price at the moment: not sure how long for. They've also just received a huge stash of handspun wool, which works out a 75 cents a ball after the discount. No-one seems to believe us when we say that the hard-core knitters among us knit all year, not just in Autumn and Winter. 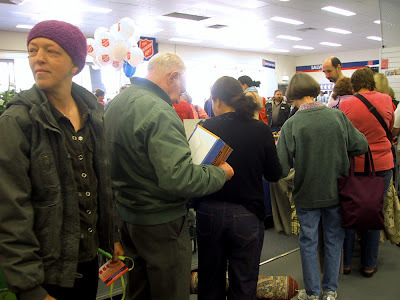 However, with Autumn almost upon us Vinnies is finally bringing out the yarn and needles again in quantity. There was new needles and yarn in reasonable amounts at Vinnies Gungahlin on Saturday (and I only bought enough for a beret). 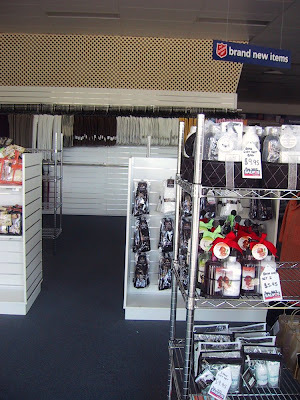 Vinnies Belconnen, certainly the most consistent source of op-shop yarn in Canberra, had a full yarn bin yesterday, according to my sources. 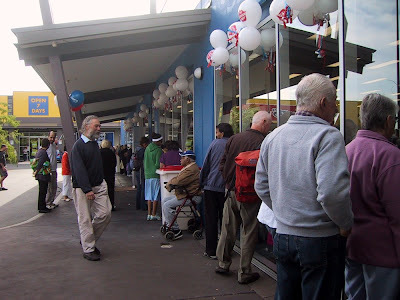 Happy Op Shop Lovers' Day! 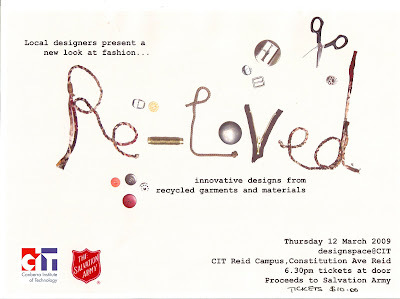 "There's another op shop that's not listed currently. It's called Barney's Boutique and it's at the Charnwood Shops. 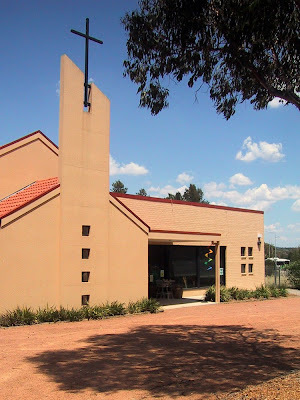 It's a little op shop attached to the St Barnabas Anglican Church that collects funds for Anglicare. The address (I believe) is 39 Charnwood Pl, Charnwood ACT. While it's a small shop, they carry nice merchandise for very, very good prices and the people who run it are very sweet. 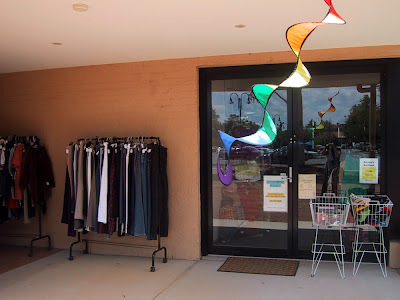 Their business hours are W-F 1:30pm - 5:30pm and Saturday 9:30am - 12:30pm." I'd say it's not worth a special trip but when combined with Reruns (also in Charnwood), Hand to Hand (Kippax) and Another Change (Scullin) it would be a worthwhile occasional op shop run. 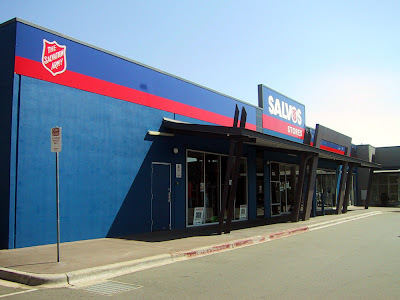 Salvos Belconnen seem to have a good selection of orphan tupperware lids. 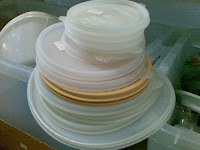 So if you have lost a Tupperware lid and want a replacement head in to Salvos Belconnen. 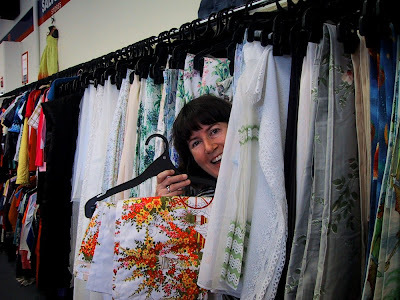 Take a virtual tour of behind the scenes in the Warnambool Lifeline op-shops. Pictures and sound. 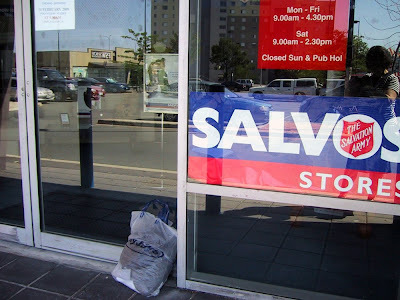 New Salvos Phillip.Where there are (illegal) donations already... (Perhaps they might like to follow the VIC plan I saw where the Salvos was open Sundays 10am - 2pm for donations only?) Bum. I bet they won't have vege options... But they do have very large TVs. Do you think JB Hi fi left them behind?